integration of research tasks into professional projects, publishing some of my work through papers, courses, speeches, blogs, etc. Meanwhile, I’ve been developing other skills: languages (HTML, CSS, PHP, Python, …); CMS like Drupal, Joomla, WordPress, Sitecore, …; SEO techniques; web analytics; Windows development; etc. This personal website itself has been fully implemented by me using WordPress and responsive web design, and is hosted in an Amazon AWS hosting. Analysis and implementation of La Morenita, a full e-commerce website based on PrestaShop. I try to keep my role as a developer in different environments; for example, I won a Windows 8 Summer Camp with ‘Menéame’, an application for Windows. Execution and results of user tests performed for a Joomla! congress. Don’t miss the videos embedded in the slideshow! Usability evaluation of static prototypes for theBellhop, documented using UCDmanager. 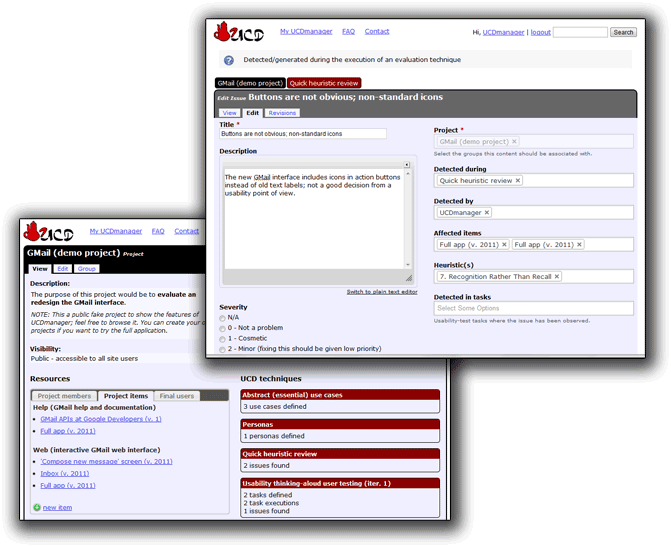 Some design considerations on Softonic, a popular website for software downloads. Evaluation of an application for Android smartphones. About the new design of GMail. My personal project UX manager (former UCDmanager) is a web application aimed to manage and document User eXperience, User-Centered Design and usability techniques, in an integrated manner: user roles, personas, heuristic evaluations, usability user testing, etc… Fully developed and maintaned by me using Drupal; includes a Windows app. UX Magazine published my article about a proposal for a set of psychological usability heuristics, which includes a spreadsheet to apply them on real evaluations. The Spanish magazine “No Solo Usabilidad” published my article about the real meaning of User-Centered Design: En busca del Diseño Centrado en el Usuario, which also includes a proposal, this time for a more practical definition of UCD. Rich web applications usability heuristics: heuristics to evaluate 2.0 web interfaces. ‘UX interpretations’ as a UCD technique: a new technique to integrate traditional+UX requirements. Ship-boarding usability: minimum set of techniques to apply when usability is incorporated into ongoing projects. ‘Top lists’ as heuristics for simple usability evaluations: at least check you’re not making the most common mistakes. An approach to an integrated software-releases workflow: organize your development environments to integrate testing+UX. I’ve done several reports in order to evaluate the accessibility conformance of several websites; some of them became part of public talks I gave, like this one about the accessibility of three websites belonging to government agencies.